• Acidification related to CO2 leakages modifies the geochemistry of metals. • Mobilization of metals from sediment into the water column is associated with their speciation. • Sediments from Huelva Estuary have relevant concentrations of As, Cu, Pb and Zn. • Risk assessment code analysis revealed that Zn presents the highest potential risk. Carbon-capture and storage is considered to be a potential mitigation option for climate change. However, accidental leaks of CO2 can occur, resulting in changes in ocean chemistry such as acidification and metal mobilization. Laboratory experiments were performed to provide data on the effects of CO2-related acidification on the chemical fractionation of metal(loid)s in marine-contaminated sediments using sequential extraction procedures. The results showed that sediments from Huelva estuary registered concentrations of arsenic, copper, lead, and zinc that surpass the probable biological effect level established by international protocols. Zinc had the greatest proportion in the most mobile fraction of the sediment. Metals in this fraction represent an environmental risk because they are weakly bound to sediment, and therefore more likely to migrate to the water column. Indeed, the concentration of this metal was lower in the most acidified scenarios when compared to control pH, indicating probable zinc mobilization from the sediment to the seawater. Rising carbon dioxide (CO2) concentrations in the atmosphere will increase the average pCO2 level in the world oceans, which will have a knock-on effect on the marine ecosystem. Coastal seagrass communities one of the most productive marine ecosystems are predicted to benefit from the increase in CO2 levels, but long-term effects of elevated CO2 on seagrass communities are less understood. Population reconstruction techniques was used to investigate the population dynamics of Cymodocea nodosa meadows, exposed to long term elevated CO2 at volcanic seeps off Greece and Italy. Effect of elevated CO2 was noticed on the growth, morphometry, density, biomass and age structure at CO2 seeps. Above to below ground biomass ratio of C. nodosa were higher at CO2 seeps than at reference sites. The plastochrome interval were similar at all CO2 seeps. The shoot age and shoot longevity of plants were lower at seeps than reference sites. The present recruitment (sampled year) of the seagrass were higher than long-term average recruitment of the communities near the seeps. Carbon to nitrogen ratios (%DW) of C. nodosa were higher in leaves at seeps. Annual leaf production was higher near the seeps. This study suggests increased production of C. nodosa under elevated CO2 levels, but other co-factors such as nutrients, trace metal toxicity must also be taken into consideration while predicting effects of future CO2 concentrations. Volcanic CO2 seeps are now being used as natural analogues for ocean acidification studies although these areas can be affected by trace element input and may alter ecosystem responses to gradient in carbonate chemistry. Here Fe and a range of trace elements (Cd, Co, Cu, Hg, Mn, Pb, Ni and Zn) were analysed from sediments and from the roots, rhizomes and leaves of seagrass at six CO2 seeps and reference sites off Greece and Italy. There were higher metal levels in sediment and seagrasses at all CO2 seeps than reference sites. Sediment Quality Guideline Quotient, a commonly used pollution index, indicated that some of the metals (Cd, Cu, Hg, Ni) were in high enough concentrations to have adverse biological effects, such as Cu at Ischia site and Hg at Vulcano. Higher accumulation of elements from sediments in roots and leaves at CO2 seeps were found from Bio Sediment Accumulation Factor index. There were higher levels of Cu, Fe, Mn and Zn in leaves and rhizomes for P. oceanica and higher levels of Cd, Co, Cu, Fe and Zn in C. nodosa compartments at CO2 seeps. Fe and Mn were found with positive correlation within sediment-roots and sediment-rhizomes, whereas Cd, Co and Pb were found with positive correlation in compartments of C. nodosa. In P. oceanica positive correlation were only observed for Cd within sediment-roots and plant compartments. Low pH and ocean acidification increased the concentration of elements at CO2 seeps than reference sites. Thus, caution is needed, when using volcanic seep systems as analogue for the effects of rising CO2, as metals can reach levels that are toxic to seagrass, masking any potential benefits of increased levels of carbon dioxide for seagrass productivity. Net community production (NCP) and community respiration (CR) were measured under air exposed and CO2 enriched conditions for intertidal Z. noltei meadows and unvegetated sediment communities during emersion in summer and winter seasons. Community production and respiration were measured in-situ using benthic chambers. CO2 flux under air and CO2 enriched conditions were measured over a series of short term incubations (30min) using an infra-red gas analyser. Incident photosynthetic active radiation (PAR) was recorded during the incubations covering the daily and seasonal variation. Linear regression model was used to test the effects of irradiance on net community production. NCP of Z. noltei community were higher under CO2 enriched conditions than air exposed conditions in both summer and winter seasons. There was no effect of CO2 on the CR rate of Z. noltei community in summer season. NCP of sediment community were higher in summer season and winter season under CO2 enriched conditions. Sediment CR rates were higher in winter than summer season. The light compensation point of Z. noltei and sediment community were lower in both seasons under CO2 enriched conditions. Seasonal budget of community production was higher in Z. noltei than sediment communities. A clear effect of PAR was noticed on the net community production of both communities. Higher PAR intensities resulted in higher NCP under CO2 enriched conditions for both communities. CO2 enrichment will have a positive effect on the intertidal communities during emersion. The effects of CO2 enrichment in marine macrobenthic communities were assessed. Acidification showed low variation in the concentrations of metals in the sediment. Significant decrease in the biological indices was reveled related to the lowest pH. The contamination and pH reduction can interfere in the benthic community indices. The effects of acidification related to the CO2 enrichment in the coastal environments on marine macrobenthic abundance, diversity and richness were analyzed in a medium- term (21 days) using mesocosm experiments. Two sampling sites located in the Bay of Cadiz – SW, Spain were selected and tested at pH values ranged from 7.9 to 6.0 (± 0.1). Moreover, variations in the concentrations of metals in the sediment samples were analyzed at the end of each experiment. The results showed low variation in the concentrations of metals in the sediment among the pH treatments. A significant decrease (p < 0.05) in the abundance, diversity and richness of assemblages were measured between the control and the lowest pH level in both sampling sites tested in this study (Rio San Pedro and El Trocadero). The majority of species were found in all samples except in pH 6.0 which only two species were found (Hydrobia ulvae and Scrobicularia plana,) in Rio San Pedro sediment fauna. In general, the results of cluster analysis showed 60% and 40% similarity in all replicated tests in El Trocadero and Rio San Pedro of sediment fauna, respectively. The results of the Principal Component Analysis (PCA) showed that both sediment parameters and pH reduction can interfere in the benthic assemblage indices. Although the assemblages’ indices have shown decreases only in the lower pHs, the organisms also could be impacted by chronic effects. 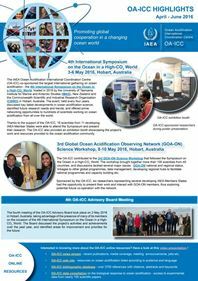 Therefore, the extension of this study is important in order to improve the knowledge about the risks associated with CO2 enrichment in on marine organisms. 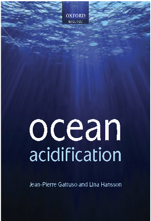 Ocean acidification refers to the lowering of the ocean’s pH due to the uptake of anthropogenic CO2 from the atmosphere. Coral reef calcification is expected to decrease as the oceans become more acidic. Dissolving calcium carbonate (CaCO3) sands could greatly exacerbate reef loss associated with reduced calcification but is presently poorly constrained. Here we show that CaCO3 dissolution in reef sediments across five globally distributed sites is negatively correlated with the aragonite saturation state (Ωar) of overlying seawater and that CaCO3 sediment dissolution is 10-fold more sensitive to ocean acidification than coral calcification. Consequently, reef sediments globally will transition from net precipitation to net dissolution when seawater (Ωar) reaches 2.92 ± 0.16 (expected circa 2050 CE). Notably, some reefs are already experiencing net sediment dissolution.